Regardless of advances in technology and the beginning of a smart watch movement, a sure-fire time-piece is, well, timeless. 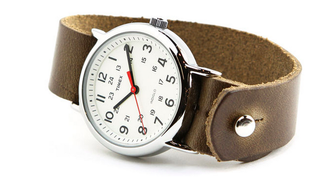 And the designers over at Form Function Form have made that abundantly clear, pairing the Timex Weekender watch face with a handmade, Horween leather wristband. Grab this custom pairing now, which includes free shipping, the original nylon wristband, and a stainless steel case for $88.